All these years later, it is very difficult to imagine people actually owning other people – human beings being the property of other human beings. Slavery as the institution it was in America’s history has an abstract feel to it now; we of course read about it, and see movies depicting it, and talk about it, but there is a great feeling of removal from it. That was a very long time ago, we all think. The Jim Crow laws of the south, too, are a part of American history that we read about and talk about in the past tense. We like to see ourselves as a progressive, compassionate people. And sadly, we’re kind of smug about it. Slavery ended a long time ago. Segregation and Jim Crow also ended a long time ago. Therefore, we are a good society. We put an end to the egregious mass mistreatment of an entire category of people based merely on the color of their skin. So, we are good. We’re certainly not racist. Racist means blatant hostility towards non-whites. Racist means saying the N-word. Racist means discriminating against people of color just because they’re not white. Right? And we don’t do those things, so we’re not racist. Because, as a society, we continue to exclude and mistreat people of color. We continue to see them (as opposed to us) as less than. We’re just a lot more subtle about it now. And largely not even aware of it. And we rationalize and justify our prejudices by telling ourselves and each other that they bring their troubles on themselves. They deserve what they get. Because they’re not like us – law-abiding, upwardly mobile, educated, white. The problem with this thinking is that white people are no more law-abiding than black people, and the data bears this out. The data also bears out that black and brown people are targeted by law enforcement far more than white people are – and it’s all under the banner of The War on Drugs. 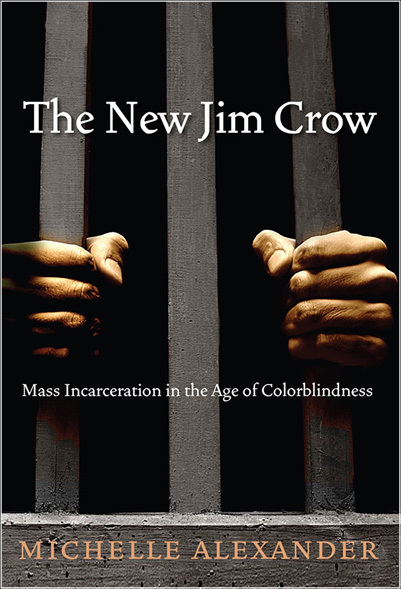 In The New Jim Crow, Alexander carefully explains how the mass incarceration of blacks – mainly young black males – under War on Drugs really has very little to do with drugs or crime, but has almost everything to do with race and making sure that non-whites – mainly blacks and Latinos – remain largely locked out of mainstream society. Want to talk about high crime rates in urban black communities, or unemployment among blacks, or lack of education and skills? Then it’s time to be honest with ourselves and each other and acknowledge that hundreds of years ago white people constructed a system that would severely restrict the ability of blacks to climb to success and belonging in society, and white people continue to maintain that system – just in a different form – today. A very provocative and important piece of work, I went through The New Jim Crow wielding my highlighter and feeling appalled. My only criticism of this book is that I wish it were written less dryly – it would be more engaging if it read less like a textbook. Still, every American should read this. I’m ordering this book. Please inform me of the knowledge that will be gained.